THE BLUE ANGEL is the first and oldest environment-related label for products and services. The proprietor of this environmental label is the German Federal Ministry for the environment, nature protection and reactor safety. Unify is the first company to fulfill the high standards of THE BLUE ANGEL in protecting the environment and the climate with its VoIP telephones. That is achieved by high energy efficiency, efficient use of materials as well as an environmentally friendly recycling concept. 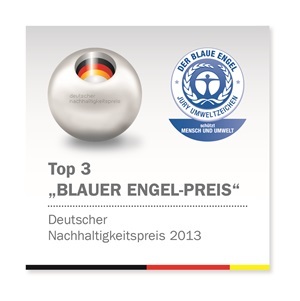 The judging panel of the German sustainability prize merits our national and international dedication to the circularization of Blue Angel with a nomination for the ‘Blue Angel Prize’. ENERGY STAR is an US Environmental Protection Agency voluntary program that helps businesses and individuals to save money and protect our climate through superior energy efficiency. Products that earns the ENERGY STAR prevent greenhouse gas emissions by meeting strict energy efficiency criteria or requirements set by the US Environmental Protection Agency. Unify is a ENERYG STAR partner participating in the ENERGY STAR program for enterprise Servers and telephony. have earned the ENERGY STAR.